Looking for the next opportunity! As some of you already know, I’ve recently become a free agent and have begun the search for my next great job. I’ve learned a lot about the “brave new world” of job hunting over the last couple of weeks, and to be honest it’s been a bit scary. I’ve only had two employers over the past 18 years, and in both cases I was laid off due to staff reductions. I jokingly told my wife that someday I’d like to experience what it is like to actually quit a job, rather than having a job quit me. After leaving my role as a Sr. Business Manager with Convergys (a large contact center organization) in June of 2007, it had been 10 years since I had applied for and interviewed for a job, and I found the idea of re-writing my resume and hitting the pavement to find a new career rather daunting. In October that same year I was contacted by someone I had worked with previously who was now working in the HR department of a public school division. She explained their IT department needed some temporary help for about 3 months, and although my role when we worked together had been in Operations, she knew I had technical skills, and wanted to know if I was interested. I accepted, thinking the work would pay some bills in the short-term while I continued to tweak my resume and find full-time employment. Instead, I re-kindled my passion for hands-on technical work, and ended up accepting a permanent position in January 2008, and worked there until April of this year. That was my first taste of social networking and finding a job. 8 years later it seems leveraging the power of social media and professional networks is the absolute best way to find that new role. The general consensus seems to be that sending your resume out electronically to a bunch of automated HR systems, or submitting your CV and cover letter through a web form is not going to get you that position you wanted. It is frightening to read articles on the subject of modern recruiting explaining how automated software scans and scores your resume and rejects it before a real human being ever reads it. How prevalent that actually is I don’t know, but I do know that when I send a resume via email, I often envision it being packed away in a warehouse and forgotten like the Ark of The Covenant in Raiders of the Lost Ark. I have a few decisions to make. The first and foremost seems to be deciding what I want to do next. In 1997 I began doing technical support in a call center and fast-forward 10 years later I had relocated twice, and been promoted through various roles within that same organization with experience in training, client services, project management, and operations management. I had managed multi-million dollar budgets, with staff and operations spanning multiple cities in Canada and the US. I had developed my business skills, and although each of the projects I had worked on over the years were technical in nature, I had not really been hands-on with technology in some time. I knew I wanted to get back to that. As a Systems Analyst with my most recent employer, a K-12 public school division, I had been able to spend the last 7+ years “doing IT” again. 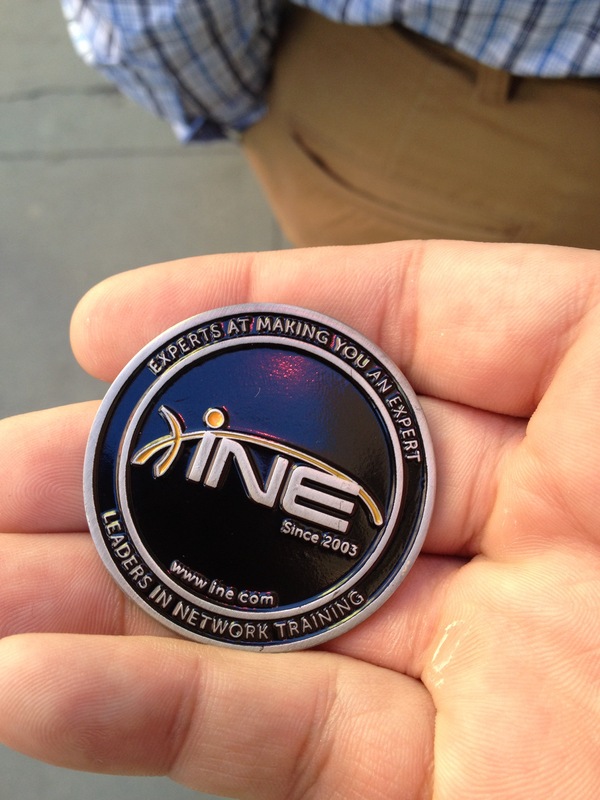 I’ve focused on networking and virtualization, and even knocked out a few certifications. The technology is what I am truly passionate about and being in a position to learn something new every day was fantastic. While it wasn’t a large infrastructure, I’ve had exposure and developed skills and experience with Cisco, HP, Dell, Microsoft, VMware, NetApp, Fortinet, and a number of other technologies. It was truly a great experience to work in a small IT shop and have access into a little bit of everything. Somewhat parallel to this I decided to combine my business knowledge and my IT skills and started my own business 2 years ago offering managed IT services to small businesses that can’t afford their own dedicated IT staff. I’m able to partner with them and understand both the key issues that drive their business, while assisting them meet any technology needs they have. The possibility of growing the business is there, but with a family, and my wife presently on maternity leave, there is something to be said for the comfort and security of full-time employment. Mainly the steady income and benefits. I could perhaps work for a vendor, doing pre-sales or post-sales support, and really get to know one particular technology. I could work for a reseller, which might provide exposure to a larger variety of products. Or, I could join another IT team, but if I did it would have to be a significantly larger organization. I want to experience work in a real data center, no more 2 rack switch closets with a portable AC unit that serve as one. My “dream job” would probably be working somewhere with responsibility for a decent-sized VMware cluster, maybe on Cisco UCS or another converged/hyper-converged platform, and management of the underlying L2/L3 network infrastructure. Wherever I go, I want to be able to make a real contribution and continue to develop myself as an IT professional. I want to ask dumb questions and learn from others and I want to be part of a great team. In my previous role there was some opportunity for on-the-job learning, but very little time or budget was set aside for real professional development. The reality is, in a public education environment, budgets seem to dwindle year after year and there is constant juggling between departments as to where the dollars are needed the most. Funding someone to take a $3000 course at Global Knowledge was out of the question. That being said, I believe ongoing learning is critical, and found ways on my own to learn, play with, study and prepare for certifications. I’ve developed a fairly decent home lab, without raising too many red flags with my wife in terms of our household budget, and have been able to prepare for and pass a number of certifications over the last several years. I’m in the process of wrapping up my CCNP R&S with one exam left (ROUTE), and completed the VCP5-DCV in December. I’ll likely focus on learning more about VMware’s NSX product and perhaps look at writing the VCP6-NV exam along with upgrading my VCP5-DCV to the VCP6 version. Long term, I plan to dedicate myself to the challenge of the CCIE. I’ve read and been inspired by a couple of other folks in the industry who have used social media as a platform or jumping-off point to find their new career, and although I certainly don’t have the same sphere of influence these people have, I’m going to try to do the same. Hat tip to Keith Townsend for sharing his story over at VirtualizedGeek.com and also to Sean Thulin whose journey is told on his blog at Thulin’ Around and congratulations to both of them on their new roles. Now, do I expect my dream job to simply fall into my lap? Of course not. I’ll be engaged in some of the more traditional methods of searching online and reaching out directly to a handful of contacts who may know of some unlisted positions. First of all however, I’ll need to tweak my resume to fool those pesky HR screening tools! So, if you or someone you know are aware of an opportunity for a skilled, loyal (2 jobs in 18 years!) networking and virtualization professional, or simply would like to learn a little bit more about me, feel free to reach me here, or on Twitter or LinkedIn. I’d love to hear from you! Otherwise feel free to share, retweet, or carrier pigeon this article and help me cast the net as far and wide as possible. Two Out of Three Ain’t Bad? The last several months have been quite a blur. My wife and I were expecting the arrival of our second child in April so way back in October 2014 I decided to spend the last few months of relative freedom catching up on some studying, in the hopes that I could knock out a few exams before some deadlines passed. I had two goals, the first was to complete my CCNP certification as Cisco had announced the end of the current track effective January 30th, 2014. I had started and stopped studying for ROUTE so many times I was beginning to wonder if I was ever going to actually finish it. I had already passed SWITCH, and I, like many others, was saving TSHOOT for last. The second goal was to attempt the VCP5-DCV exam. I had taken the VMware vSphere: Install, Configure, Manage course early in 2014 and had a voucher for 85% off the exam, but it had to be used by the end of 2014. I didn’t think I was prepared for it, but why waste an 85% discount? I decided to at least get a peek at the exam and gauge where I needed to focus in order to pass when I took a “real” shot at it. I’ve never failed a Cisco exam more than once. Each time I’ve failed an exam I’ve taken a little time to regroup, and then focus right back on the areas I was deficient in, scheduled a re-take and passed. With ROUTE, this was not the case. I had failed it previously twice, both as my free exam at Cisco Live. Maybe it was the environment, staying in a hotel, lack of sleep, or the fact that it was “free” and something in my subconscious didn’t take it seriously, but for whatever reason I had not been able to massage a passing score out of this particular exam. Now, my exposure to a lot of the L3 subjects has been limited, in that my day job had very little routing other than some static routes between sites and our ISP, so I had my work cut out for me starting all over again and learning OSPF, EIGRP, and BGP from scratch. I dedicated myself beginning in October to studying for this exam. I was going to pass it if it killed me. I had Wendell Odom’s CCNP ROUTE 642-902 Official Certification Guide, I had video training from Pluralsight, INE, and CBT Nuggets, I had the Boson practice exams, I had physical lab gear, I had virtual lab gear. This was it, I was going to pass. December came a lot quicker than I had anticipated. You see I was fighting with two deadlines, the expiration of my VCP exam voucher at the end of December, and the end of the current CCNP track of exams. I had hoped to pass ROUTE by mid-December and then take a run at the VCP exam, knowing it was just a trial run, and then finish off TSHOOT sometime in January. By mid-December I felt I wasn’t ready for ROUTE yet, and my studying was getting more and more difficult as I read and re-read certain chapters and concepts that I just didn’t seem to grasp very well. It was time to take a break. So, I scheduled the VCP5-DCV exam for December 29th and spent a couple of weeks re-reading Mastering VMware vSphere 5.5 by Scott Lowe and Nick Marshall, playing around in my VMware home lab, and testing myself with the MeasureUp practice exams. Passing the VCP gave me a boost and so I re-focused on the ROUTE exam with a scheduled exam on January 16th. When exam day rolled around I felt I had a good shot at passing. The usual light nervousness hit me as I sat down at the PC and began to read through the usual Cisco exam agreement, but I focused and started the exam. Well, I failed. and not by much. I was devastated. I had felt so prepared, but some of the simulations just caught me off guard for some reason. Back in my car I scrambled to recall areas that I needed to re-focus on and take notes, but I was seriously considering walking away from this exam for a while. With the encouragement of a number of friends and peers on social media, I decided to at least take a run at TSHOOT before the end of January. This would at least mean I had 2 of the 3 exams under my belt and I could re-focus on the new ROUTE exam in February. I scheduled TSHOOT for January 24th, and just in case, re-scheduled ROUTE for January 29th. Knowing I could cancel up to 48 hours in advance, if I didn’t pass TSHOOT I wasn’t going to take another run at ROUTE. I didn’t study much for TSHOOT to be honest. I’ve heard from many people it’s the type of exam you can either do, or you can’t. If you understand the L2/L3 technologies behind the topology (freely published and available from Cisco) then it all comes down to whether or not you can troubleshoot in an orderly, systematic way that eliminates possible problems, and identifies the root cause of the issue. I did run through some of the tickets in the Boson TSHOOT practice exams, more or less to get comfortable with the format. I also did a bit of review on the “dry” subjects that would likely be part of the multiple choice questions that focused on methodologies like ITIL, etc. When I sat the exam on the 24th I didn’t think I could feel any more relaxed. They way the exam is formatted you pretty much know if you got the ticket right or not, so by the end of the exam I was expecting to see a perfect score. It wasn’t perfect, but it was about as close to perfect as you can get. I think I may have gotten one of the five multiple choice questions wrong, but seeing a score that high was confirmation at least that I did in fact have the skills necessary to continue with this career path. I had been pretty discouraged after failing ROUTE yet again, but this gave me the boost I needed to take another run at it. I didn’t see much of my family between the 24th and 29th, I was so focused on reviewing the areas I needed to improve to pass ROUTE. I felt really good going into the exam center on the 29th. So good in fact that I think I got over-confident. I had some repeat questions and simulations from my previous attempt and when faced with those I had the attitude “Oh yeah, I know this” and didn’t spend enough time really making sure I was answering the question correctly. I got through the exam way too quickly but 100% expected to see a passing score. And it was really close, too. I passed two out of three exams in a 4 month period, ending up 2/3 of the way to completing my CCNP and adding the VCP5-DCV to my list of accomplishments. I think I’m okay with that. I’ve already purchased the new Official Certification Guide for the new 300-101 ROUTE exam, along with some practice exams, and although there are some new topics on the exam I don’t think it will be all that different from the old exam. Two goals for this year will be to complete the CCNP and then I would like to focus on VMware’s NSX product and perhaps write the VCP-NV exam. I’ll also have to think about upgrading my VCP certification to version 6 sometime. Certifications aren’t easy, as anyone who has ever taken one will tell you. You have to be able to take a failure and learn from it, and not get too discouraged. I know I’ll pass ROUTE, I’m stubborn that way. It used to be that the only way to get any direct, hands-on experience with any networking gear was to have access to some actual, physical equipment. It was an expensive prospect, and often out of reach for most beginners to invest significant dollars into owning their own lab gear. Back in 2000, when I first got started in this area, there were no companies offering remote rack rentals, there were no good simulators, and there weren’t companies selling refurbished networking products at a deep discount. Ebay was available, but the products you were looking at there were quite often from questionable sources and probably not genuine. Needless to say it was very difficult to gain experience working hands-on with the products you were hoping to get familiar with. Certification training, especially on a budget, was something that was very difficult to do on your own. Over the years projects like Dynamips and Dynagen would provide some limited simulation functionality for Cisco IOS, but in 2007 as part of a university Master’s thesis project, Jeremy Grossman would begin developing GNS3. GNS3 would evolve to become one of the most widely used networking simulators available and many a networking student working towards certification would find it an invaluable resource for learning. Now, in 2014, GNS3 continues its evolution. Now, I’m a sucker for a local success story and Stephen Guppy, CEO and Co-Founder of GNS3 is located just south of me in Calgary. I thought I’d reach out to him to discuss the past, present, and future of GNS3 and talk to him a little bit about their role in training and certification for the networking professional. After surpassing the 10 million download mark, they decided to launch a crowd funding campaign, in the hopes that they might make GNS3 sustainable in the long-term. So far that campaign has been a great success with over 13,000 contributors and over $553K in funding. The midnight launch of the campaign actually broke Crowdtilt (now Tilt) but they were very responsive and had things back up and running quickly. They met their initial goal in 3.5 hours and hit over 100K in 18 hours. For contributors to the campaign, the first Alpha release of the new GNS3 became available April 1st, 2014, and Beta releases in mid-July. Their goal is to have the first version of the “final” product in December. The original GNS3 had become somewhat bloated with redundant modules and was a bit of a patchwork over the years with multiple contributors. For this new iteration Jeremy started from the ground up, with less than 5% of the original code going in. The design goal here was to develop a solid framework that could have modules added onto it. This meant simplicity when adding on support for VMware, HP, Juniper, etc. The GUI and general feel of GNS3 hasn’t changed much so long time users of the product aren’t going through a huge learning curve with the new version either. The end result is a much more robust tool that takes up fewer resources, loads and runs faster, and is generally a lot friendlier to use. 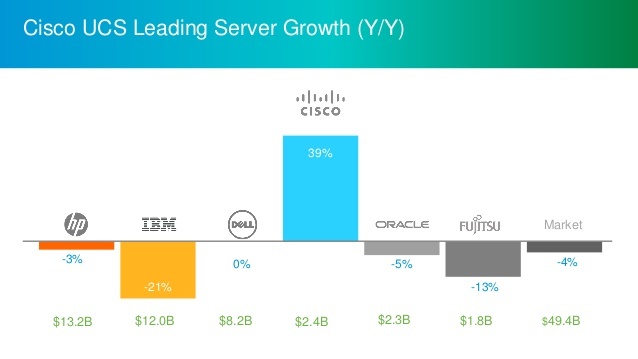 Jeremy and Stephen had seen some interesting data over the last two years, and that was a steep decline in Cisco usage, with Stephen indicating a 25%-45% decline year over year. As they expanded into markets outside the US, other vendors were more dominant, including huge demand for Juniper and Huawei. GNS3 for many years had been known as a “Cisco” simulator but in reality, they aren’t. Their goal is to be the “CML for all vendors” and be able to offer the network engineer a platform to work on whatever vendor product they require. The huge surge in virtualization has made it incredibly easy to integrate various vendor systems into GNS3. Not only that but with more and more vendors offering ‘free’ versions of their platforms to use in lab and test environments, access to the software has never been easier. Stephen admits they rarely have to address any legal/licensing issues because they’ve simply made sure they were always on the right side of the law. They also have direct relationships with a lot of the major vendors, including Cisco, having been in talks with the product managers for CML and VIRL, as well as having other vendors approach them directly asking for integration into GNS3. Stephen mentions the relationship with the vendors should be “symbiotic” and in their discussions with various internal product managers, etc. all have indicated that GNS3 has value for them, providing highly trained people and a platform for test and development. “I hope Cisco pushes the boundaries, GNS3 has needed a little competition.” Stephen says, laughing. Having known about CML and VIRL for a very long time due to their relationships within Cisco, they’ve been very excited for release of these products. Stephen calls these a “declaration to all the other vendors” and a challenge to them to provide the same level of support for the network professional. CML, the paid, TAC-supported platform has already been released, but VIRL – the free, community-supported platform remains vaporware. 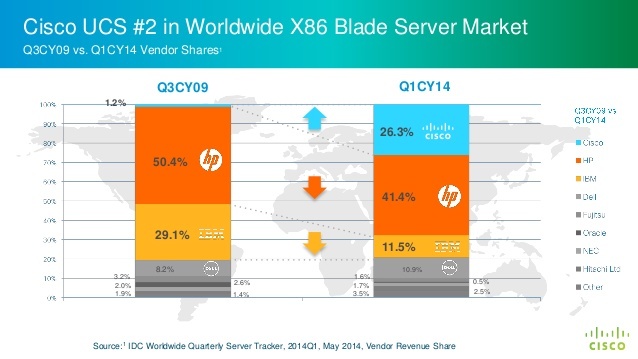 However, should Cisco decide to release VIRL sooner than later, I wondered how a “free” product would impact them? Stephen admits these products will impact GNS3 in some way, as a competing product, but a lot of the feedback from those with early access to these new platforms seems to be that while they were generally good products, people eventually moved back to GNS3. In 7 years the GNS3 community has evolved to a group that has very knowledgeable people who understand the product very well. Stephen says plans here are to really nurture this relationship and harness the people within the community, starting with a “legitimate, real community portal”. He cites Thwack (the Solarwinds community portal) as an example. I’ll admit that over the course of the interview with Stephen I learned a lot about the product that I didn’t know. I had been guilty of seeing GNS3 as a “Cisco simulator” but learned that their focus has not been single-minded, and that support for pretty much any vendor was their goal. Training and Certification remain a huge part of what they are focused on. Plans include a full CCNA platform including labs and documentation, all for free. This is huge. As anyone who has set a goal for a particular vendor certification, the costs associated with the training and studying are sometimes a limiting factor. For GNS3 to be able to offer community-driven material as well as a platform for labs, is incredible and speaks volumes about the goals Jeremy and Stephen have for their software. As the new product evolves it’s plain to see that these guys are passionate about what they are doing and the energy they are putting into this new iteration of their product is tremendous. The GNS3 brand itself has undergone a massive overhaul as they reimagine themselves not only as a training tool but as a legitimate choice for network modeling, development, proof-of-concept work, etc. It’s clear that as GNS3 evolves from “that Cisco simulator” into a full-fledged multi-vendor, multi-purpose network virtualization platform that it seeks to become a core component of every network professional’s toolset. 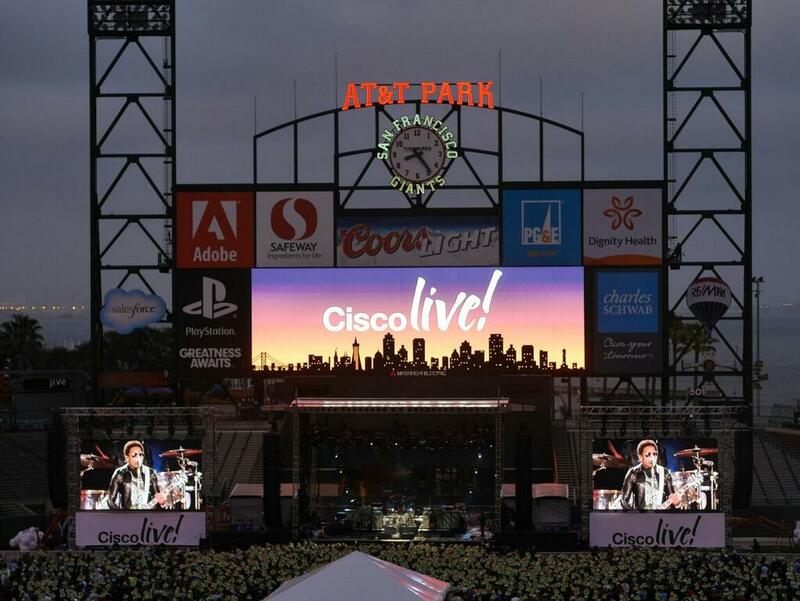 Cisco Live 2014 – San Fran-tastic! My 5th Cisco Live is in the books and this was a fantastic week of reconnecting with friends, meeting new ones, and drinking from the technology fire hose. This was my first visit to San Francisco and although I didn’t get to be a tourist very much, what I did see of the city was great. My hotel wasn’t in the greatest part of the downtown area, but even so the walk to and from Moscone never seemed too scary. As I mentioned in my pre-show post my schedule this year was packed with sessions, meetings and events, much more than previous years. I arrived on Sunday and the whirl wind week of activity began immediately. I managed to get to Moscone in time to register and pick up my badge and bag before the 5:00 pm closing on Sunday. After checking into my hotel and dropping off most of my gear, I went straight back to Moscone South for the Welcome Tweetup. 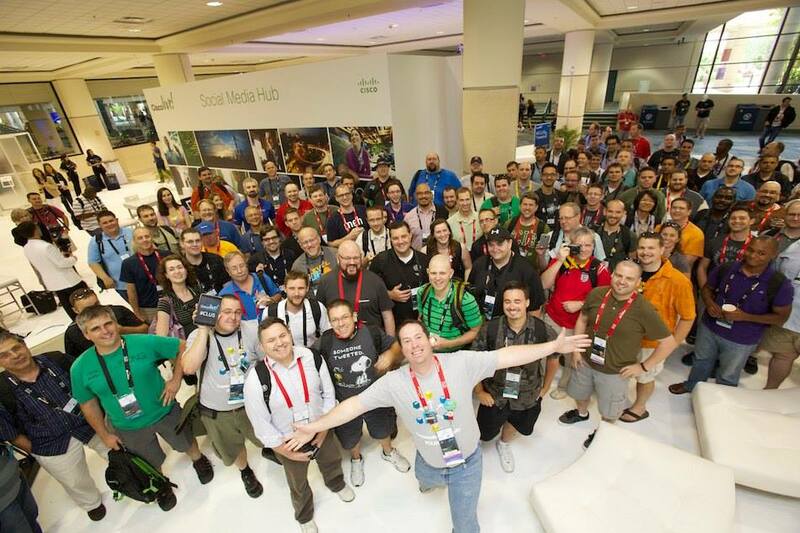 This had grown exponentially over the last few years and the 2014 Tweetup was no exception. It’s always great to be face to face with the people you interact with all year on Twitter and other social media platforms, and this year was made that much more special with the #CiscoChampion program adding a number of new people to the mix. 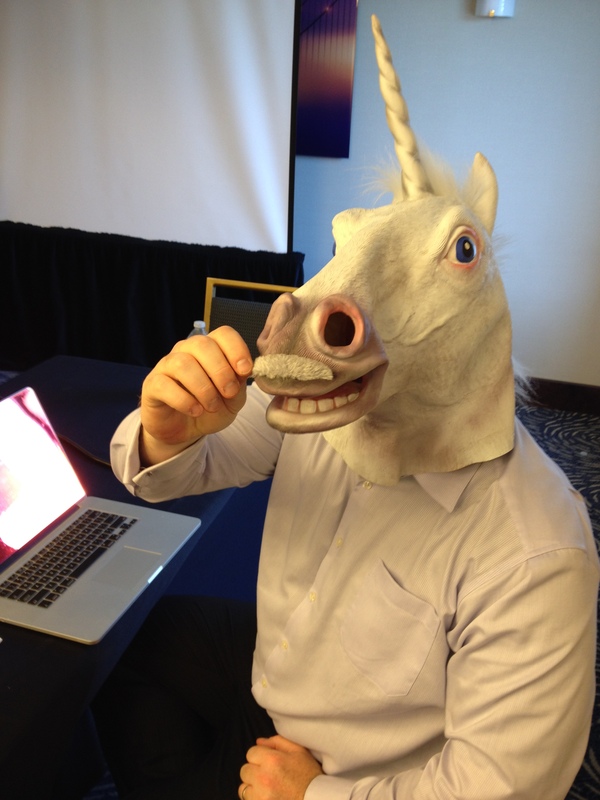 The appearance of the SDNicorn marked the beginning of what was going to be a week filled with networking (in several terms), socializing and yes, even some shenanigans. If you’ve ever attended Cisco Live or other events like it, you’ll know it’s near impossible to schedule in all the breakout sessions that you want to attend. There are simply too many of them. I’ve had a couple of years where I was focused on a particular technology, mostly because of a specific planned project at my day job, but when I can I prefer to have as much variety in my schedule as possible. Cisco has made this far less stressful because selecting one session over another doesn’t mean I have to miss the content for the one I didn’t attend in person, it simply means I can view it later on Cisco Live Online (formerly Cisco Live 365). This is a fantastic resource all year long, and I find myself going back to watch and re-watch content from the various Cisco Live events worldwide. 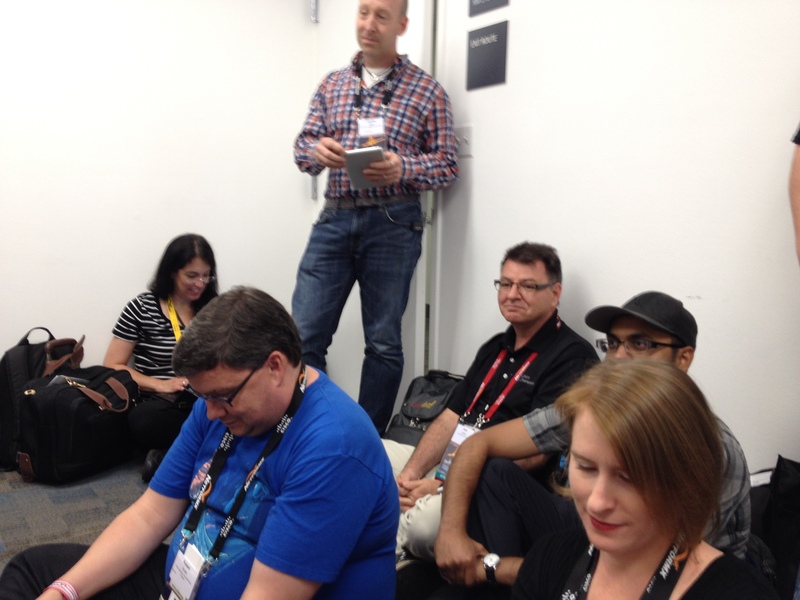 This year’s sessions included some Collaboration, UCS, Virtualization, and Nexus sessions. Also, thanks to Robert Novak (@gallifreyan) over at rsts11.com I was provided a complimentary 4-hour lab, and I chose to attend the Intelligent WAN (IWAN) Hands-On Lab. The IWAN lab was fun, given that I got to spend some time working with gear and software that I don’t normally get to play with, particularly UCS-Express (in the form of ISR-2911’s with UCSe blades), and Cisco Prime Infrastructure. A lot of this lab focused on Cisco Prime and seemed more of a DMVPN lab mixed with some WAAS and QoS, but it was still a great learning experience. Throughout the week there were some fantastic opportunities facilitated via the Cisco Champions group. These included an excellent (and revealing at times) team building event, a live Cisco Champions Radio episode hosted by Amy Lewis (@CommsNinja) in which a large number of us piled into the smallest room possible to record a really entertaining podcast, a tour of the Cisco NERV truck, and a briefing on the upcoming Cisco Modeling Labs (CML) product. 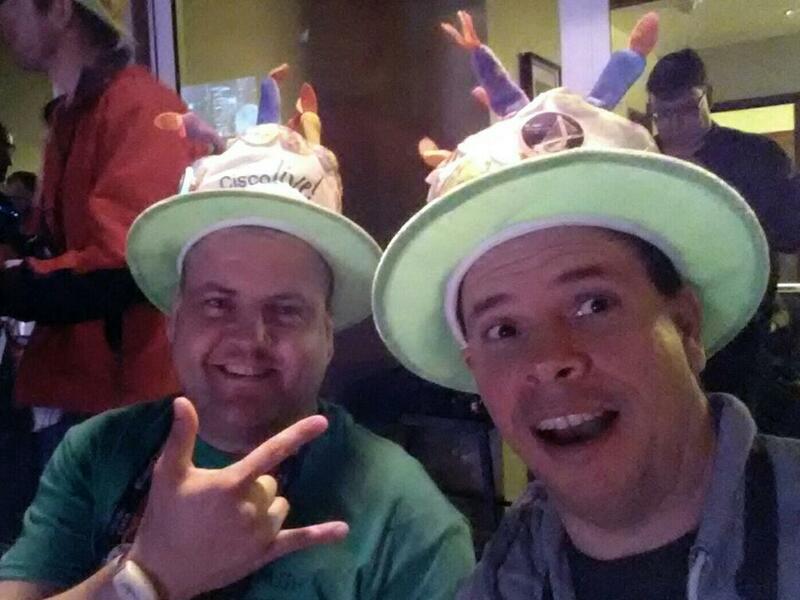 For me, these activities were more about connecting with a group of people who I’ve “met” through the Cisco Champions program via Google+, Twitter, and podcasts, but hadn’t yet met in person. I was absolutely blown away by the diversity of this group and the opportunity to meet face to face and share some conversation, some knowledge, and a quite a few good laughs as well. The fine folks over at @CiscoDC along with infamous bacon advocate Amy Lewis hosted an awesome party at the Cable Car City Pub on Monday evening. 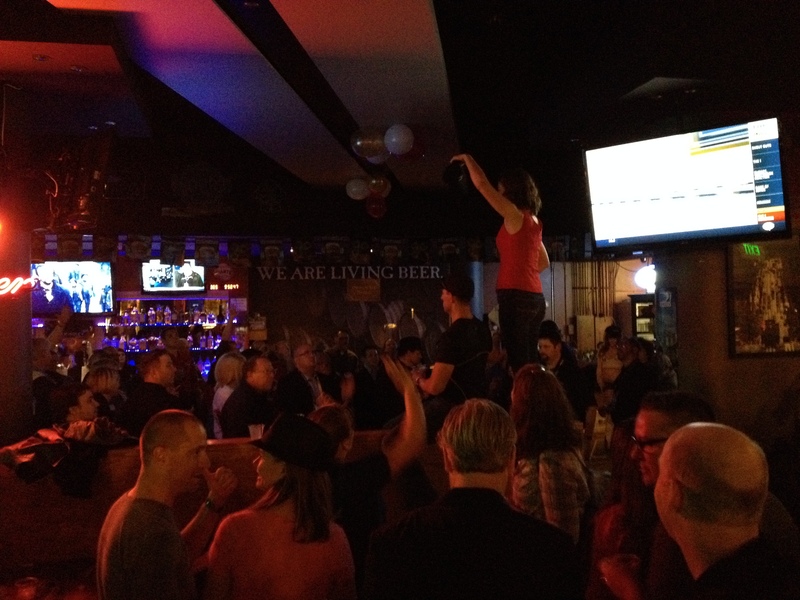 This was a fun social event that gave everyone an opportunity to wind down after the first full day of sessions and enjoy meeting some more of the social media personalities, Cisco Champions, and Cisco staff. The evening included some bacon-related giveaways, including subscriptions to the bacon of the month club. There was even a food table replete with….bacon. INE once again hosted a customer appreciation event that included some excellent prizes (congrats to @bbaize on winning a Macbook Air!) and some more food and drinks. 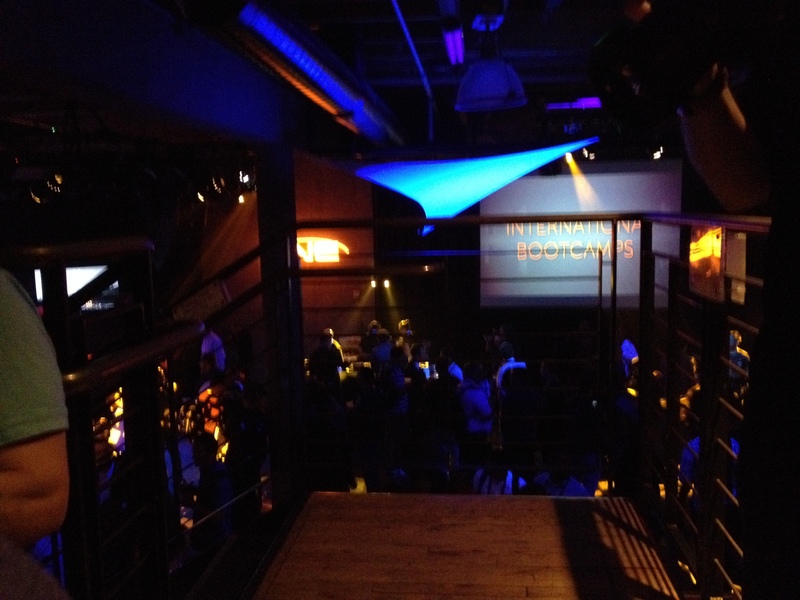 After mercilessly harassing Mark Snow (@highspeedsnow) and Brian McGahan (@brianmcgahan) I managed to procure one of the VIP tokens that provided access to an exclusive section of the Mezzanine Nightclub. They also used the evening to preview their upcoming revised and retooled training platform which promises to be a tremendous platform for studying and certification along your chosen Cisco track. The Rewired platform offers an interactive community approach to learning, including badges, achievements and looks to add a bit more “fun” to the task of studying for a Cisco exam. I’m really looking foward to the launch of this product, and attendees of the event were told they would have beta access sometime in the upcoming months. 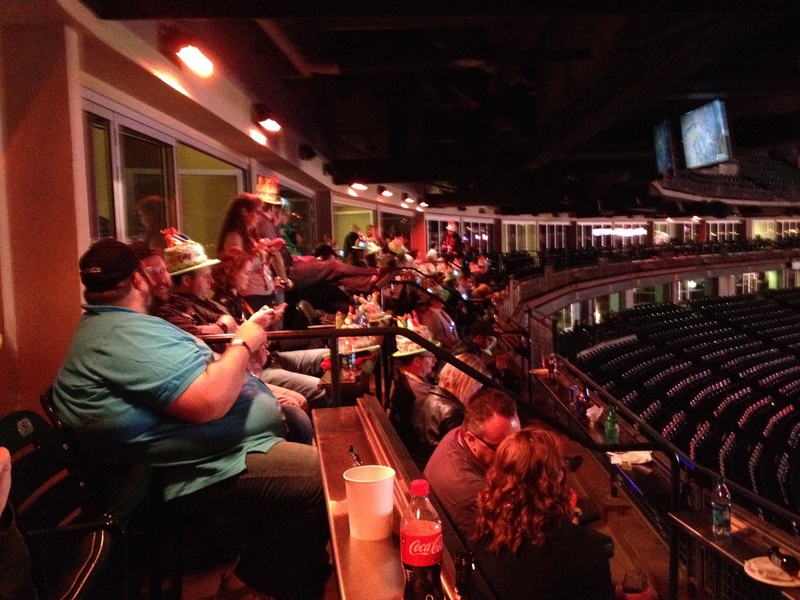 The annual CAE is always a great time, and this year was no exception. We invaded AT&T Park, home of the San Francisco Giants, and were treated to some awesome food, a few beverages, and live performances from Lenny Kravitz and Imagine Dragons. I would have loved to see Kravitz as the headliner, but then again I’m old. He played a fantastic show, playing many of his hits from the 90’s and 00’s. Imagine Dragons’ set got off to a rocky start when the power went out to their amplifiers, but after a brief “Please Standby” everything got back underway. The rocked out the remainder of the evening and the evening’s finale was a brilliant fireworks display launched from a ship in the San Francisco Bay beside the park. The Thursday of Cisco Live is always bittersweet as the final sessions of the week wrap up, the last of the prizes are given away at the World of Solutions, and everyone heads to the airport to scatter across the world back to their homes. This year was no exception. The farewell Tweetup was held at the Social Media Hub Routed Bridge (no idea, ask @amyengineer) and everyone had an opportunity to take a few more photos, play a few more hands of Cards Against Humanity #CLUS, and say their goodbyes. 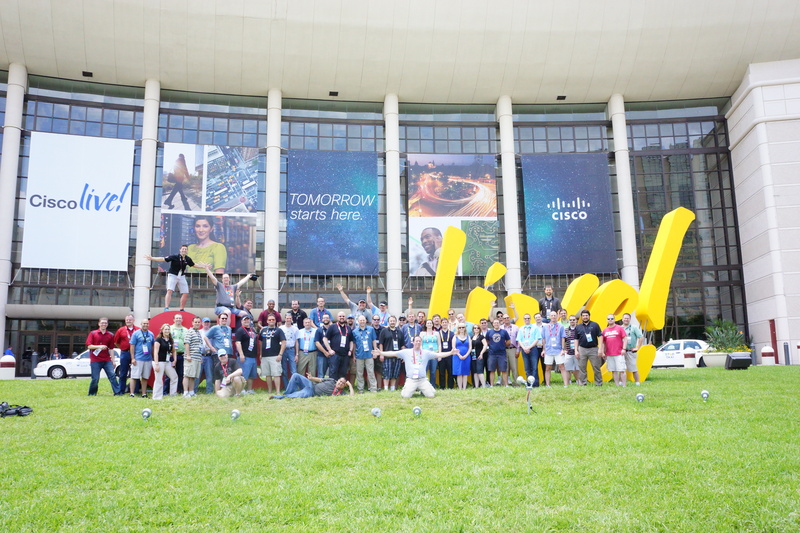 As is tradition the group photo at the Cisco Live sign marked the end of the week, and I bid farewell to my fellow Twitterers, Champions, and friends, and headed to the airport. 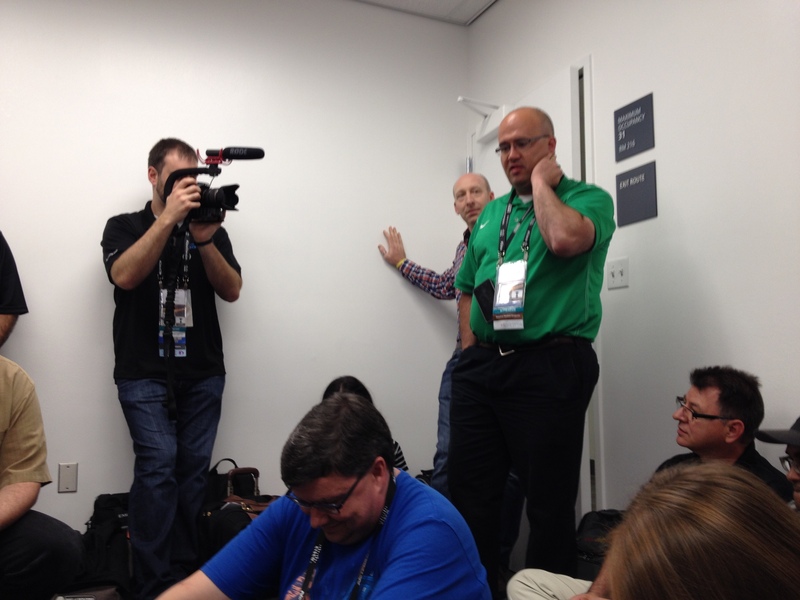 Cisco Live 2014 was for me, the best Cisco Live yet. They seem to get better every year and I’m not quite sure how that happens, but it’s true. 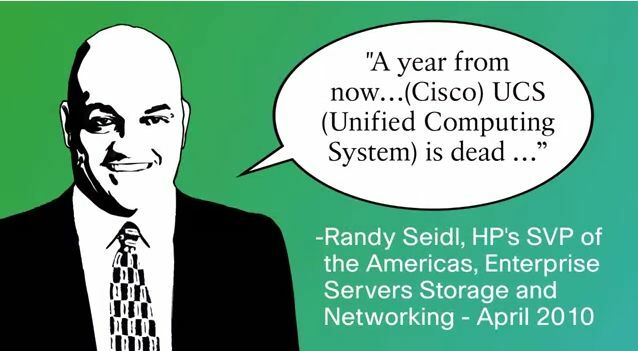 From the moment I left San Francisco I started to look forward to next year, and Cisco Live 2015 in San Diego. 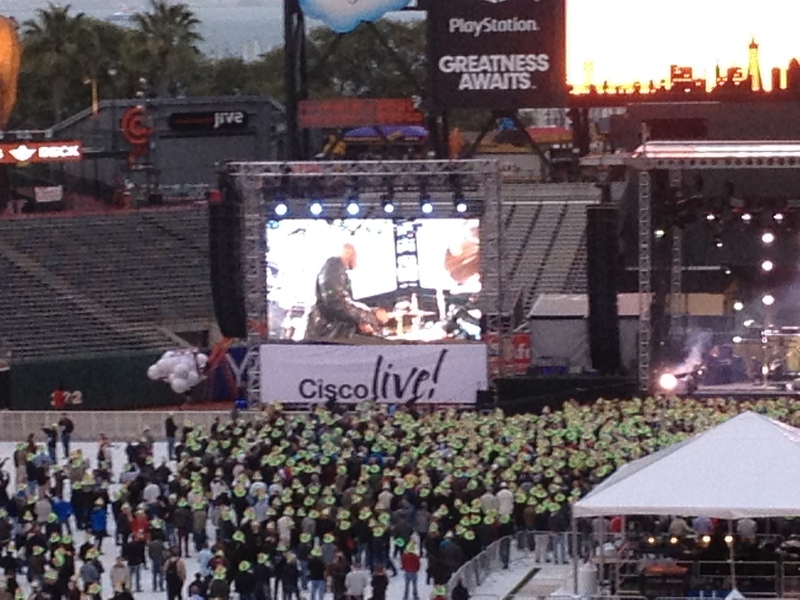 For those still waiting on official word about the when and where of this year’s Cisco Live 5K Fun Run – here it is. The run will take place Wednesday morning at 7am at Rincon Park. 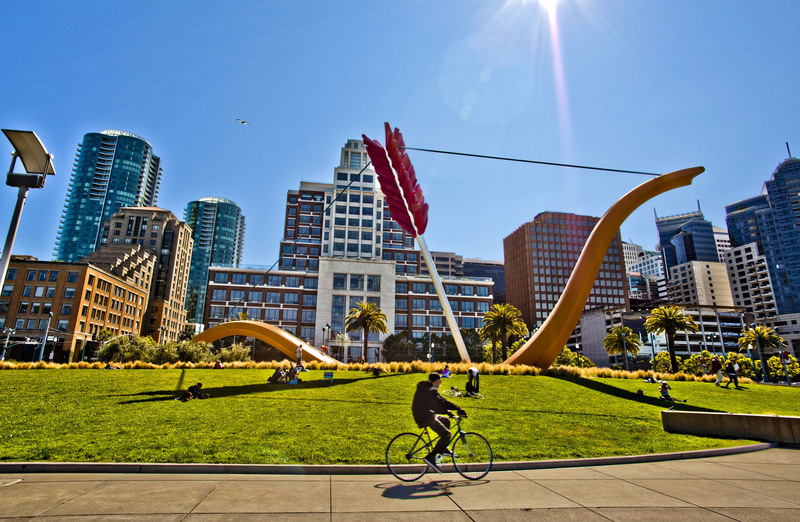 It’s pretty much straight up Folsom street from Moscone Center to the bay, and the park has a huge red and yellow bow & arrow sculpture to identify it. We will be running along the San Francisco Bay Trail to Pier 39 and back. Come and walk, run, heckle, prod, or anything else you can think of in support of this year’s run. It won’t be as crazy as the Bay to Breakers but it’s always a fun run with a group of great people. Cisco Live 2014 is only two days away and although I like to think I’ve planned everything out well in advance, I’ll likely be doing a lot of last minute panicked preparation early Sunday before my flight. This will be my fifth Cisco Live, my first one being the 2010 event in Las Vegas. Things have changed for me significantly since that first conference, and every year it just seems to get better and better. To be honest it’s become the one networking/professional development event I absolutely cannot miss every year, such that I pay for the majority of the trip myself. Working as I do in the public sector, where budgets seemingly shrink every year, while costs and expenses rise, I do not have the benefit of a large professional development budget. Much of the training and certification I have done over the years has been self-paced, self-funded, and conducted in my home office and lab. 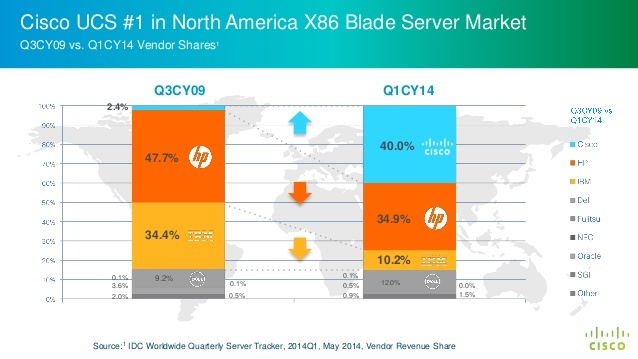 This includes the costs incurred for Cisco Live. What budget I do get every year (usually between $1000-$1500 CAD) I put towards the conference registration costs. This does help put a dent in even the early-bird conference price of $1995 USD, and I appreciate the fact that I get anything at all towards my continued education. Travel can be expensive but I’ve managed to get pretty thrifty over the years, and more often than not find pretty good deals on hotels that aren’t part of the Cisco Live “official hotel list” but are in close proximity to the conference location and other amenities. In 2011 for example, I was able to stay The Excalibur in Las Vegas which is literally across the street from the Luxor, Mandalay Bay, and MGM Grand, which are all official Cisco Live hotels, for about 1/3 the price. The tram running along the strip provided fast transport over to the Mandalay Bay for the conference events. This year was an even bigger challenge with hotel prices in San Francisco bordering on insane. There was no possible way I was going to be able to attend this year if I had to book one of the official hotels which ranged from $170 to $399 per night. My schedule is so packed every year I actually don’t spend a lot of time in my hotel, so it’s basically a place to sleep for a few hours before beginning another day of social networking, learning, and fun. With that in mind I booked a room at a hostel-style hotel called The Winsor that’s a decent walking distance away from The Moscone Center. I’ll have a small room with pretty much just a bed and a sink, and a shared bathroom. The reviews on various travel sites said the neighborhood wasn’t great but the hotel was decent, even if it looks a bit shady. 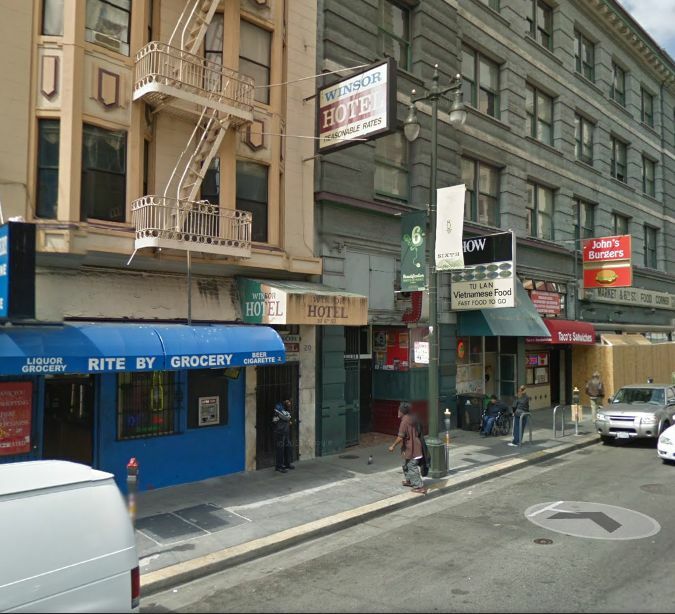 The proximity of liquor, beer, and cigarettes will be convenient, at least. 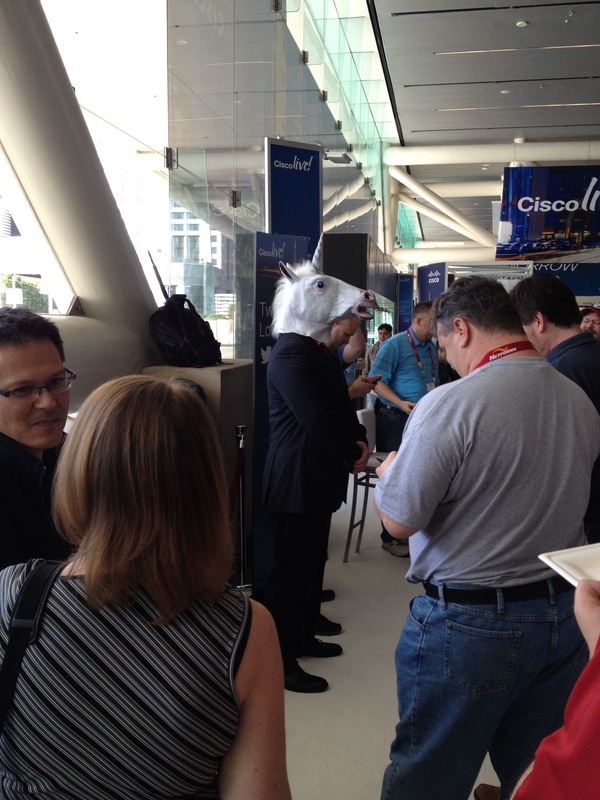 The first year I attended Cisco Live in 2010 I was purely alone. I didn’t know anyone, I wasn’t very active on social media, and I had no idea what to expect from the conference. I focused on maximizing my time in breakout sessions with the intent of learning as much as possible in the week I was there. I lurked on Twitter and saw there seemed to be a community within a community here and quickly saw some of the same names interacting with each other, with mention of “tweetup” and “Tom’s Corner”. In between 2010 and 2012 I spent a lot of time following some of the more active names from that first event. People like Tom Hollingsworth (@networkingnerd), Jeff Fry (@fryguy_pa), Amy Arnold (@amyengineer), Stephen Foskett (@sfoskett), Tony Mattke (@tonhe), Eric Peterson (@ucgod), and Jennifer Huber (@jenniferlucille) just to name a few. I discovered the Packet Pushers podcast where a lot of these folks got together with Greg Ferro (@etherealmind) and Ethan Banks (@ecbanks) to discuss current topics and trends in networking, and started listening to the back catalog of recordings. I learned about Tech Field Day and it’s delegate program and with it another list of names of people I started to follow and interact with on Twitter. 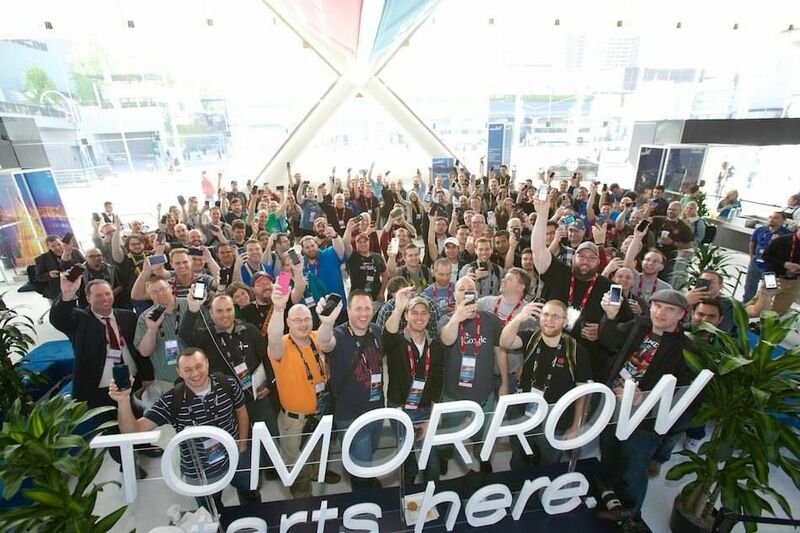 As I built both the group of people that I followed on Twitter as well as those who followed me, I began to feel a real sense of community within these groups and carried that forward into the next visits to Cisco Live. 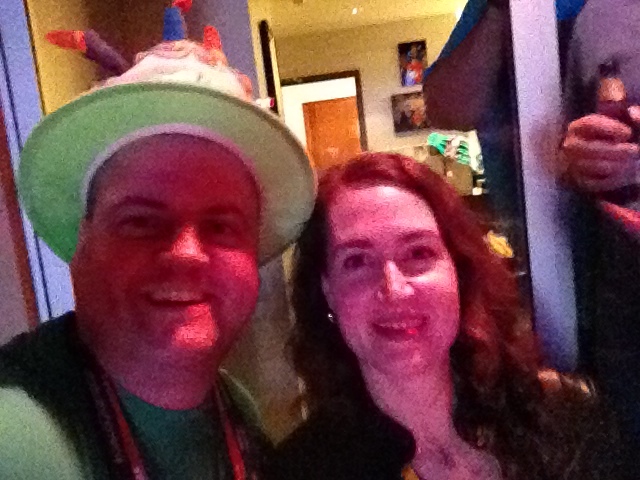 By 2013 in Orlando the trip to Cisco Live felt less like attending a trade show and more like a reunion with a large group of friends. 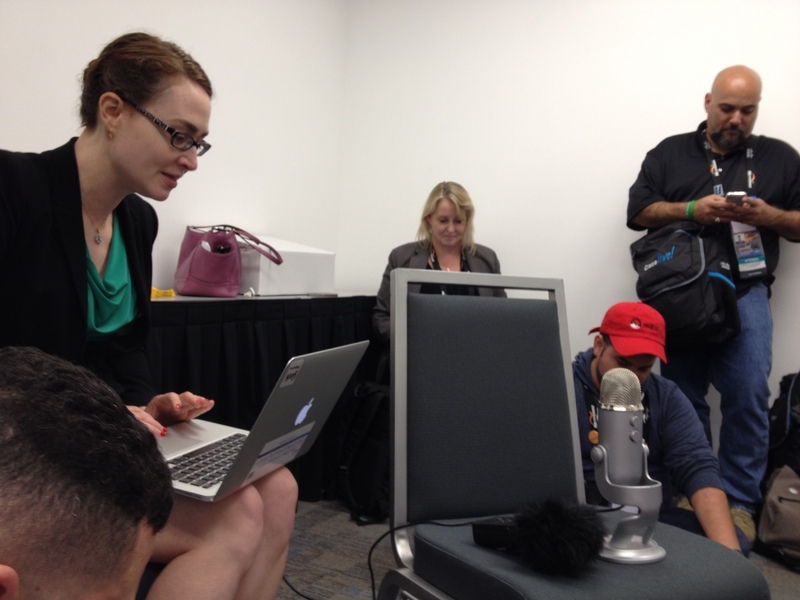 “Tom’s Corner” had evolved into the Social Media Lounge, and it was clear that Cisco was putting a lot of effort into social media and this large subculture of networkers who populated it. The welcome Tweetup was the largest it had ever been and once again it was a welcome opportunity to reconnect with old friends and meet new people as the social media crowd grew even larger. Now in 2014, the #CiscoChampions group has grown quite a lot and there are several events scheduled for us in San Francisco. My schedule now is even more jam-packed between regular sessions, social media events, Cisco Champion events, Tech Field Day round-tables and somewhere in there, time to eat and sleep. The Customer Appreciation Event is going to be excellent this year with Lenny Kravitz as the headliner, and Imagine Dragons in support. 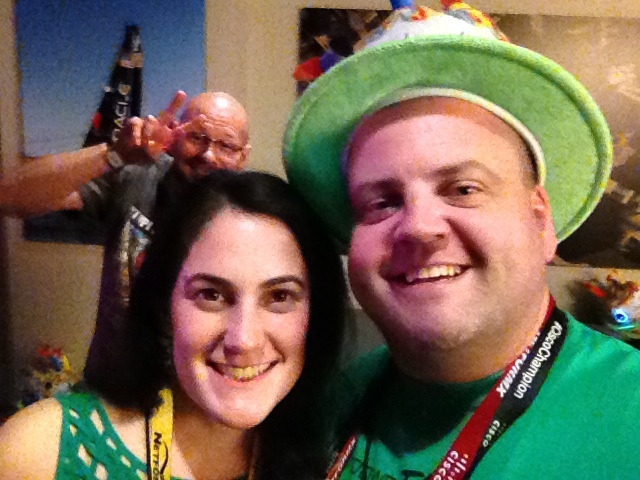 The #BaconIT meetup with Amy Lewis (@commsninja) should prove to be another great evening with friends and bacon (and maybe a beverage or two). And I’m also looking forward to running in another 5K with Colin McNamara (@colinmcnamara) in support of the Wounded Warriors Project. Rumor has it we might be running across the Golden Gate Bridge! I’m truly looking forward to another great year, and can’t wait to see you there!